Japanese vocalist,guitarist and composer.Lives in Tokyo. Born and raised in Takarazuka which is a small town bitween Osaka and Kobe.She began learning piano at age 5.Since she entered a junior high school,she began to recite the domestic and the American popular songs by her own accompaniment.She sang at home every day. At age of 19 Noriko entered Kobe University to study Architecture.There she met the female guitarist Marimo Sugahara.To the end time of the 1980s, Noriko began to sing the songs which Marimo wrote, which were influenced by old American music,blues,and Rock.Noriko came to appear on a bar in Osaka and sang by accompaniment of Marimo. Noriko's interest moved to Latin musics gradually.She listened to various styles of music as :Salsa,Meringue,Borelo,Tango Argentina,folk musics in Peru and Fado in Portugal. Finally she met Bossa Nova and became absorbed in the Brazilian music. In 1995 Noriko moved to Tokyo.She began activity of singing Bossa Nova,Samba and MPB(Brazilian Popular Music) in Portuguese. 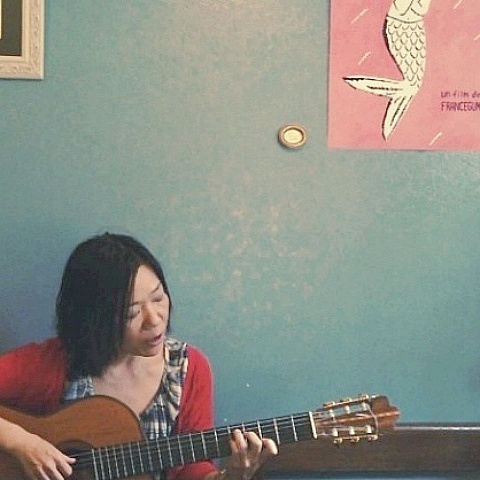 In 1997 she went on to the School of Yoshiro Nakamura, who is a master of Bossa Nova in Japan.There she played the guitar for the first time and fell in love with the delicate tone of strings.A year later she began to sing by own accompaniment of guitar on stage. Noriko played continually in the bar and the Brazilian restaurant in Tokyo.And sometimes she held the one-day-school of Bossa Nova. In 2001, she worked with the composer Masakazu Uehata for commercial song of HAAGENDAZS ice cream. In 2002 Noriko recorded her first album "CALOR" produced by Masakazu Uehata.Nevertheless it was published by independence work, it is superior in quality and expresses the essence of Bossa Nova faithfully.It contains 5 songs wrote by her in Portuguese.In this album,her smoky voice spreads in the air and would fascinate the audience so much. In May,2004, her second album "ANEL DE CAPIM(THE RING OF GRASS)" was published. The title song "Anel de Capim" is very impressive tune. With this work she come to known as a talented songwrighter. In March,2006, "BITTER SWEET" was published.Different with the current works, she plays the pop songs of America and U.K. like The Eagles, Prince, Paul Weller and so on. She had challenged to sing in English and to interpret these tunes in her way of BossaNova.This work is successfully praised by a lot of listeners.